Halak Starts: Jaroslav Halak will start in goal for the Islanders against the Boston Bruins. The Islanders netminder has played in 12 of the team’s last 13 games and is 26-9-0 this season with four shutouts. Halak did not play in the Islanders 3-2 win over the Bruins on Oct. 23. Same Lineup: The Islanders will roll the same lineup from Tuesday’s 4-1 win over the New York Rangers. Boychuk: Johnny Boychuk is set to face his former team for the second time since being traded to the Islanders on Oct. 4. The charismatic Boychuk had a throng of Boston reporters around him after today’s optional morning skate and shed some light on his first season with the Islanders. 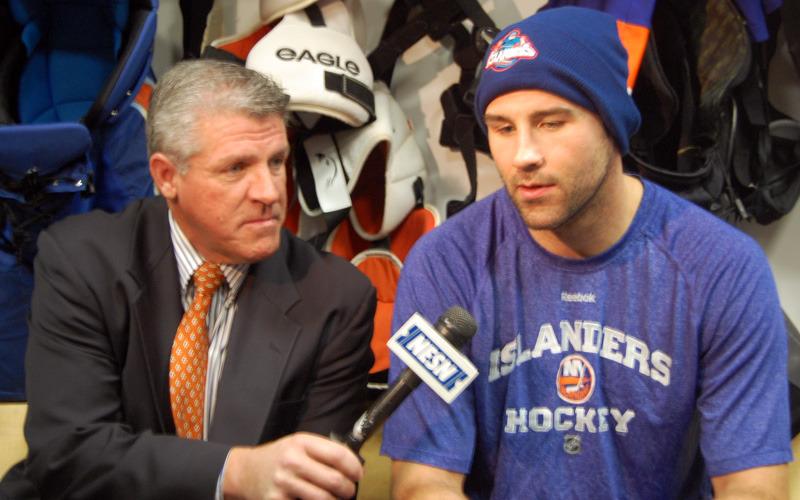 Boychuk: After the first two practices, I knew what kind of team we had and how good we actually were. After the first couple of games, then you really knew how good we were. We’ve been playing well. We have skilled, speedy forwards and some tough forwards. So you see some similarities in what we had back when we did win. We have good goaltending and good defense. There’s always a chance. We’ve played consistent this year and we just have to continue to do so. Clutterbuck an Alternate: Cal Clutterbuck was designated an alternate captain in Kyle Okposo’s absence and started wearing the “A” against the Rangers on Tuesday. Clutterbuck said he’s never had an issue speaking up in a room or on the bench, but the letter gives him better authority to speak with the refs. LIKE A BOSS: Tonight is Mike Bossy Mini-Locker Night (presented by Mohegan Sun) and the Islanders all-time leading goal scorer will be honored before the game. Bossy is one of six Islanders players to have his jersey hang in the rafters and is the sixth of those same Islanders to be honored this season. The sharp-witted Bossy spoke with the media this morning. Bossy on Fort Neverlose: We’d go out there and we had such a good team and such good fans that I always felt we had a 2-0 lead before the first puck was dropped. We were an intimidating team. We were intimidating because of many factors: the talent we had, the work ethic we had, the size we had. We had a little bit of everything. Bossy on Yes! Yes! Yes! I thought it was pretty special that the players have adopted it. It’s created a connection between the fans and the players. When you get the fans on your side, they may be a little more lenient in certain circumstances and little louder in others. Bossy on scoring 50 goals: I have no doubt that I’d still be able to score 50 goals. I always said, getting a quick release was for me, was far more important than aiming the puck. I always thought giving a goalie less time to prepare for something made him less able to stop the shot. 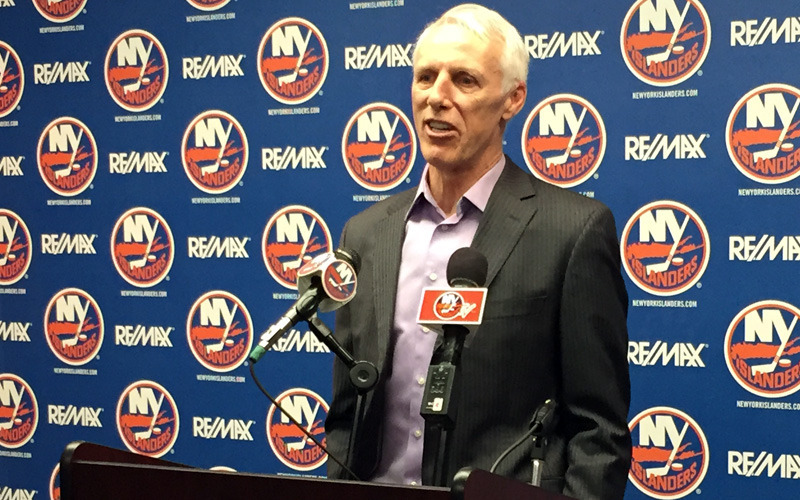 Bossy on the current Islanders: This whole season is a little surreal. I don’t think anyone expected the team to be where they are today. In general these guys are more mature, they know how to handle more situations a lot better than they used to. They have a number of lines out there with good chemistry together and its working.